On October 16, 2017, the Appellate Division, Second Judicial Department, will hold one of its two sittings that day at the Maurice A. Deane School of Law at Hofstra University. 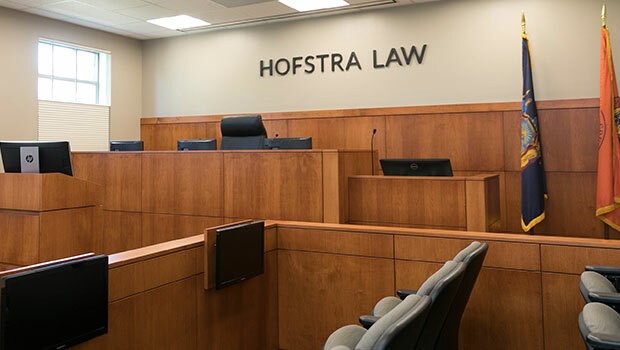 Presiding over the sitting will be Hofstra Law alumnus Associate Justice Leonard B. Austin ’77, who also serves as an adjunct professor at the Law School. He will be joined on the bench by Associate Justices Sandra L. Sgroi ’78, also a Hofstra Law alumna, Sylvia O. Hinds-Radix, a proud parent of a Hofstra Law student, and Angela G. Iannacci, who hails from Nassau County. The Justices will be sitting in the Law School’s newly redesigned Weitz & Luxenberg Trial Courtroom, which has been updated with the latest advancements in courtroom technology. Hofstra Law students will have the opportunity to watch the proceedings, which will be followed by a Q&A session with the Justices.